Director John G. Avildsen talks about the struggling early days of ‘Rocky’ as a new box set shows 8 mm footage behind-the-scenes of the lean 1976 classic. Director John G. Avildsen remembers the struggle to make the original 1976 ‘Rocky’ which won three Oscars. Avildsen believes his ‘starving’ actor Stallone and the movie were better because the budget was so lean. ‘Rocky: The Heavyweight Collection’ features 8 mm home films giving a rare glimpse of the lean set. For director John G. Avildsen, the lean times of 1976’sRocky were the best days of the iconic boxing franchise. 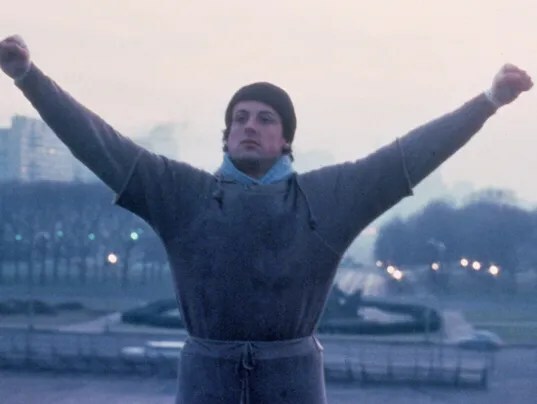 The film won three Oscars, including best picture and best director for Avildsen, and shot little-known screenwriter/star Sylvester Stallone into a different stratosphere after his performance as a down-and-out boxer with one shot at the big-time. A major franchise was born from a film made on a budget of less than $1 million. “We never sat down in that movie because we didn’t have any chairs or craft tables. One Winnebago served as everything — a honey wagon and a wardrobe trailer for everyone. We were very lean,” says Avildsen. It’s interesting to watch Rocky change, along with Stallone, in the new Blu-ray/DVD set Rocky: Heavyweight Collection released as part of MGM’s 90th anniversary. The set features all six films spanning 30 years, from Rocky to 2006’s Rocky Balboa in remastered and Blu-bay format. It also features newly found 8 mm behind-the-scene footage from Rocky which shows just how tough things were in the beginning. This entry was posted in Current Events and tagged MGM, Oscar, Rocky Movie. Bookmark the permalink.